At Pro-Turf Landscaping, we take pride in our 3-year warranty on new sprinkler installations. 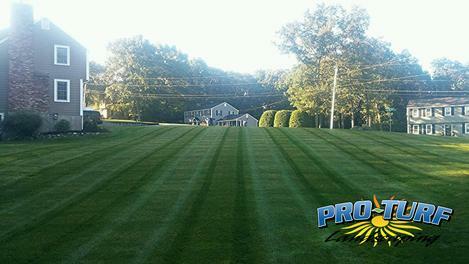 When you install a new system through us, we extend the 1-year manufacturer's warranty to a 3-year Pro-Turf Warranty! We are confident in our warranty, that we have no problem sharing it before you hire us! 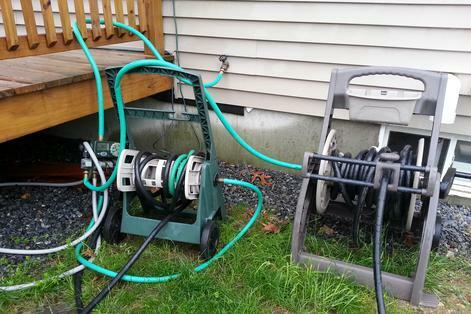 There must be no existing irrigation on the property at the time of installation. Pro-Turf must be the only company to service the system in the 1st three years. You must hire & pay Pro-Turf to start-up and winterize the system each year to maintain the extended warranty. If you start-up your own system in the 1st three years, and we don't have a chance to go through it, this will void your warranty after the manufacturer's 1-year warranty. Damage from plows, lawn mowers, digging, vehicles, vandalism etc is not covered. Damage from aeration is only covered if Pro-Turf performs the aeration. The pipes are buried deep enough to not be affected, but all heads must be flagged. Lighting strikes and power surges, or other acts of nature are beyond our control and not covered. Sometimes heads can stick up due to sediment or small rocks, these can be popped back into position by stepping on the head carefully. This is not considered a warranty issue, and there will be a service call charge to come push them back down. Any head hit by a lawn mower due to this will not be under warranty. Sometimes minor leakage can happen if heads are externally damaged. This is not considered a warranty replacement unless the seals in the head are determined to be defective. Heads can need re-adjusting over time. You have 1 complimentary head adjustment service call in the 1st thirty days after installation. All calls for head adjustments after the initial 30 days will incur a regular service call charge. Heads are always adjusted during spring start-up service for no additional fee, or easily adjusted with a screwdriver. Warranty is not transferable upon change of ownership. This includes systems we install on new construction once the house is sold. There may be other exclusions to our warranty. These will be explained on a case by case basis, and are rare. This warranty is in place to cover defective products. Your installation date will be recorded in your account. You will receive a copy of this warranty information with your controller instruction manual. In the event that an account becomes past due, or payment is withheld once services are performed, Pro-Turf reserves the right to void any amount of time left on the warranty.